Roti John has a very interesting history. It was invented in Singapore in 1976 by an enterprising Muslim hawker named Shukor, whose Caucasian expatriate clientéle frequenting his stall at the Taman Serasi Hawker Centre beside the Botanic Gardens, always ask him to fry up an onion omelette to eat with a side order of french loaf. Shukor decided one day to fuse the onion omelette together with the bread that voilá! Roti John was born. Why Roti John? Well, roti is Malay for bread... and John? Well, at the time, all Caucasians were generically called John. 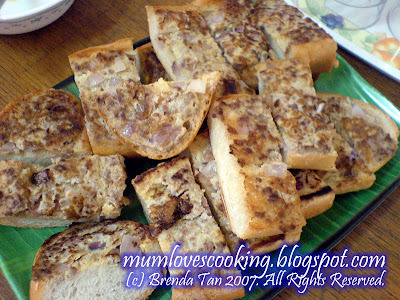 *grins* So in honour of Shukor's clients, he named them Roti John. The added minced/slices of beef/mutton came slightly later, but you'll be hard-pressed now if you were to find any hawker selling Roti John sans meat. 1. Mix the minced beef, chopped onion, eggs, salt and pepper together. 2. Heat up a frying pan with about a tablespoon of cooking oil. 3. Scoop the beef mix onto a piece of bread. 4. Quickly press the bread, beef-side into the hot oil. Hear the pan sizzle. Smell the aroma of the oil meeting the egg and onions. Use a spatula and give the bread a good press down and then flip it over to make the crust crispy. 5. Remove from the pan and slice the bread smaller if needed. 1. Mix all the ingredients together. The mix should be a bit runny rather than thick. 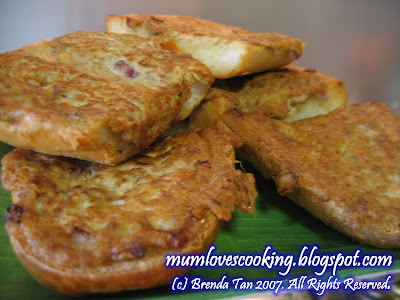 We made Roti John for Edna's first Birthday party last week, and it was a favourite with our guests. We made chicken curry to accompany the Roti John.